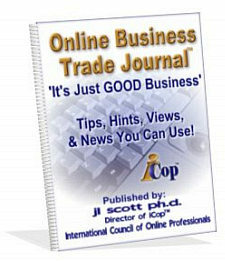 This iCop™ newsletter is for anyone interested in online business - "Just GOOD Business!" The Online Business Trade Journal™ is vitally important to online business owners and anyone considering an online business! This is the same newsletter our iCop members receive with their membership! Our goal is to keep folks informed. We give you step by step directions on exactly how to protect yourself as a business owner - AND as a consumer - online. And, we answer reader questions right in the newsletter! How to do your own due diligence on a company before handing over your money! How to survive - and prosper - as Online Business comes of age as a serious industry! We report on businesses using questionable business ethics, those using hidden charges, etc., and outright scams. Have subscribed to many, have canceled most (99.9%). Your newsletter is great! It's informative, interesting, humorous and written with quality and style. I look forward to reading it every week. More people need to read your stuff. The Internet is a vast black hole, waiting to swallow the unsuspecting, the newbies, and the trusting. I am so pleased you are on the web ... to help guard against crooks and other low lifes. Boy did YOU save my behind! I have been reviewing various affiliate programs for my 3D images and the one you mentioned as a "Stay Away" company is one I was looking at. Thanks a million for the HEADS UP! Don't take out the personal comments. If you do, you'll become one of those publishers that "have nothing to say." The priorities go to something that can brighten the day or make the reading a bit more interesting. It's the personal comments and anecdotes that make me read the whole darn thing. I love your ezine... always have, it's one of the few I still consistently read. Why? Because you always share a little personal 'jl tidbit' with us... and then you get down to business and teach us something we may not have been aware of or just rant about something we all were upset about but maybe couldn't express as eloquently. It gives a feeling of belonging and that someone still cares about what's happening with online marketing. 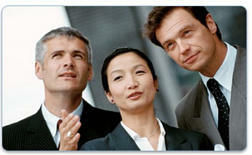 I think the thing that sets a great ezine apart from a good ezine is the personality of the publisher. Those who are afraid to inject their personalities usually provide boring reading. Of course, an ezine must contain valuable content but that doesn't mean that it can't also be interesting, funny, and entertaining. Keep on doing what you're doing! . As far as I'm concerned, your whole newsletter is not long enough. I generally read it twice, keep up the good work. We do need you. Just to let you know, I love the iCop issues. I look forward to every one of them, it has saved me a lot of unnecessary heartache, not to mention unnecessary wallet problems. Now, I wait for your ezine before I check out anything. Please KEEP the personal stuff. That's what makes your ezine so interesting. It's not so cut-and-dried that when it arrives I READ it, and do not trash it as I do so many, many others. Of course, I want the business stuff also. I have learned a great deal from your news. Just wanted to let you know that whenever I see your newsletter in my e-mail box, I click it on and read it immediately. Like people read the newspaper, I read your ezine knowing that the information inside is important for the continual growth of not only me as a businesswoman, but also my e-zines! You have been very helpful, and I always appreciate your insight. Click Here for more Trade Journal Comments! Your sign-up brings you the weekly newsletter of the International Council of Online Professionals (iCop™). You'll receive the SAME weekly news received by iCop™ members and thousands of online business owners - as well as those just starting out. Since so much email is not delivered due to spam filters, it is important that you white-list the ezine address or you may NOT be able to verify your subscription! Directions for white-listing will be found on the page you're taken to after submitting your subscription! Once you verify your subscription - with just one click - you'll receive a "Welcome" email containing a link to download the very popular "iCop Desktop Directory" FREE! This handy directory will help you avoid the online hype-masters and scam artists. It leads you, instead, straight to the most reputable and ethical online companies to do business with. You will also receive a link to download - absolutely FREE - a clever little ebook that allows you to make money online - even without a website! You may also receive occasional email regarding special offers direct from iCop.™ ONLY our subscribers receive these special offers! AND - our newsletter regularly includes "Freebies" for our subscribers only! We will never share your email address with anybody, period. Read our "Terms of Service" above. Unauthorized use of the iCop™ Seal will result in a $5,000 fine!